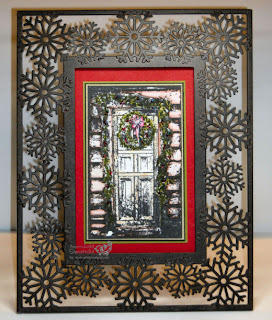 I found this really cool rustic looking snowflake frame at Kohl's last week, and knew it would be perfect to pair up with the Snowy Woods plate from Artistic Outpost. My image is stamped in Black Archival Ink on watercolor paper, then colored using markers and the Marker Water Coloring Technique from a past TJNL issue. 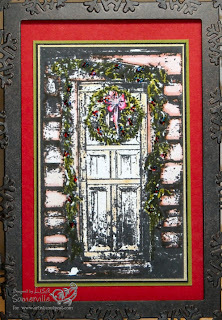 After I was finished coloring, I added a bit of stickles to the wreath and greenery around the door. Are you a fan of Artistic Outpost images? Be sure to check out the Artistic Outpost Referral Program? Be sure to stop by Pat's Blog today to see what she and other members of the TJNL Design Team created today for the TJ Blogstravaganza! Pat's also got some great Artistic Outpost Blog Candy for her Wednesday Giveaway! That is just beautiful, Lisa. Wonderful choice of framing for your artwork, Lisa!